Welcome to the tourism area of Tulungagung regency. This regency is located at east region of East Java province and has already to welcome the tourists to enjoy all scenery and various traditional cultures. Begin from a district named Ngrawa, it develops into regency in East Java and now Tulungagung is as same as the other town in Indonesia. 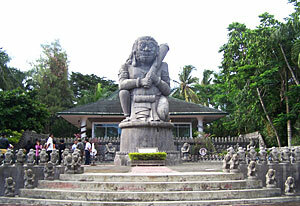 Tulungagung regency has thousands tourism object that interesting to be enjoyed by both, domestic and foreign tourists. Tulungagung has complete tourism; nature tourism, beach, mountain, culture and history, like; Homo Wajakensis that ever be famous in anthropology scientist, and couple of historical sites. Tulungagung regency, which is part of East Java Province has many natural beaches. This regency has many beaches and bay collections. The famous beach of Tulungagung is Popoh Beach. This beach has known by both domestic and foreign tourists. Popoh is faced directly with Hindia Ocean and offers its exotic of beach. The government and society around are take care it well and equipped it with some tourism facilities, such as; hotels, restaurants, souvenir shops, mosque, park area, entertainment stage, etc. Tulungagung is often called as the warehouse of culture, especially Javanese culture that still develop in the society around. The traditional cultures are still continuously and have many fans. The cultures are; puppet, ketoprak, reyog, tayub, ludruk, jaranan, kentrung, etc.